As part of its Learning and Development programme, Eqstra Fleet Management and Logistics has introduced the Eqstra Bursary Programme. The latter is an accredited NQF level learnership bursary to assist family members of employees who are looking for qualifications and work experience. After receiving more than 50 applications, 12 suitable candidates were selected for the first bursaries. The candidates chose the area in which they wish to study – that is finance, marketing, and so forth. Aternatively, they are able to rotate freely through the business until they find their preferred area of expertise. The programme lasts for a period of 12 months. The candidates spend threedays of each month on theory and practical courses, after which they are requested to provide a portfolio of evidence to assess their competency levels. During the rest of the month they are allocated to a project to gain on the job training and new skills. At the completion of the course, candidates receive a Business Administration NQF4 certificate, accredited through SETA and are assisted to find permanent employment. 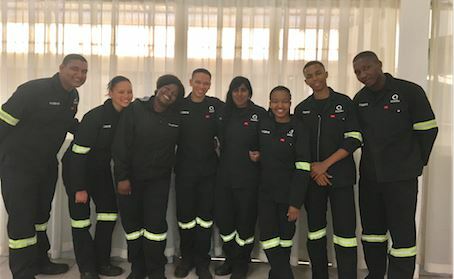 “Our first group of candidates achieved a significant success rate,” says Kayt Naicker, transformation specialist at Eqstra. Other programmes offered by Eqstra include a three year Apprenticeship Programme in which suitable candidates are chosen from one of the company's Social Economic Development Programmes - “Eqstralution”. This was implemented to focus on disadvantaged technical schools, namely the Pretoria or the Rhodesfield Technical High Schools. Candidates study to become qualified Diesel Mechanics at the Eqstra Training Academy situated on the East Rand and are assisted with academy costs, meals and accommodation, transport and uniforms. In addition and as part of the training course, Eqstra funds the costs relating to obtaining a Code 14 drivers licence. To gain practical experience, the apprentices work at Eqstra workshops based in Durban, Clayville and Germiston. Eqstra also offers 18 month long internships to external candidates during which they can gain work experience and on the job training in any field of business including human resources, marketing, finance and business, aiding them to achieve their qualification. Other Youth development opportunities offered by Eqstra include sponsorships through the Theo Jackson Scholarship fund (Eqstra is currently sponsoring 4 learners from Grade 8 through Grade 12 at Jeppe High School for boys and then onto university next year) as well as aiding additional learners from Rhodesfield Technical High School with tuition and residence fees. Once the learners obtain their qualification they are employed at Eqstra for two years to attain work experience. All programmes see successful candidates paid a stipend to cover their living and transport costs.